PALM SPRINGS, Calif. - June 2, 2018 - PRLog -- Actor/Writer/Director/Producer Harley Wallen will be a featured guest on The Jimmy Star Show live radio/tv show hosted by King of Cool Jimmy Star along with Cool Man About Town Ron Russell to discuss his career and the entertainment industries at large. The Jimmy Star Show is tv/radio's coolest hit show, featuring the coolest in music, entertainment, fashion and pop culture, all from a fun industry insider perspective in a completely live, unedited fast-paced two-hour conversational format. Multi award-winning filmmaker and actor Harley Wallen has starred in over 40 feature films and TV shows with legendary stars such as Tom Sizemore, Tara Reed and John Savage among many others. He started his journey as a Martial Artist early with Judo at age 7 and is now a 5th degree black belt. Harley also spent time learning other arts (Jiu-Jitsu, Tae Kwon - Do black-belts as well) and Mixed Martial Arts. His other love at a young age was dance as he was an outstanding break dancer in his teen years. His sheer talent and skill is what landed him his first opportunity in acting as a dancer at the syndicated Swedish TV cult hit 'Solstollarna'! Soon after, he realized he was bitten by the acting bug. Harley then moved from Sweden to the United States to boldly pursue his dreams. After a short stint these plans got sidetracked by business opportunities as Harley climbed various career ladders. After returning to acting It wasn't long before the roles started coming and the growth he had experienced in the business world started happening to him in the acting world. After the film incentives ended in Michigan, he decided to start making films of his own. Not having a film school background with only limited experience, he decided to go online to further his education in filmmaking and took several more classes and seminars in acting. Finally in 2016 Harley and his wife Kaiti formed the film production company 'Painted Creek Productions'. The one thing he really takes pride in is his commitment to the character he is playing regardless the size of the role or the paycheck. Harley is now writing, producing, acting and directing and has found his life's purpose. 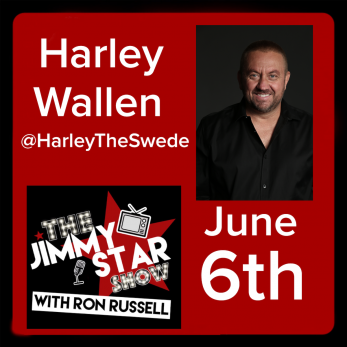 The Jimmy Star Show with Ron Russell is pleased to showcase the expertise and talent of Harley Wallen and all anticipate a fun and informative time talking with him about his career and the entertainment industries at large. To hear/see Harley Wallen live on the Jimmy Star Show with Ron Russell tune in to W4CY radio on Wednesday June 6th, 2018 from 3-5 pm ET and 12-2 pm PT online at www.w4cy.com from anywhere in the world!